"Hey dude! Nice going back there!" I felt a hand land over my shoulder so I looked at the owner of the hand who was a blonde teenage boy with strikingly blue eyes. I just stared at him and after a moment his smile fell and he removed his hand from my shoulder and backed away. "Uh sorry." I just blinked. And then it hit me. He just realized that I was a god. "Uh it&apos;s okay." I said. 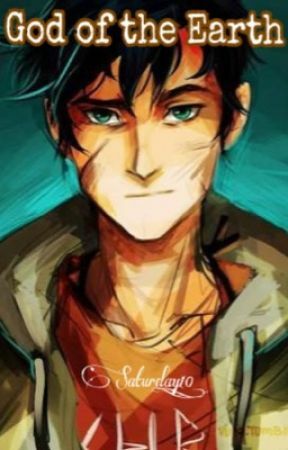 "I&apos;m Percy and you are?" I grinned at him to reassure him. He grinned back and said, "Hi Percy! I&apos;m Luke!" I just kept my grin but in my mind I was thinking, "Uh... What do I do now..." But thankfully, he spoke up. "Do you want to celebrate your win with us? C&apos;mon, it would be fun!" Luke said with mischief sparkling in his eyes. His friends, most with elfish ears and mischief in their eyes, gathered at his back. "Uh sure. What will we do?" I asked him unsurely. I didn&apos;t like the look in his eyes. "Let&apos;s go on an adventure in the forest! You can get some experience from this and next time, defeating Artemis would be a piece of cake." He said enthusiastically. I didn&apos;t like the way he said &apos;adventure&apos; but I wanted try it. My body was burning with energy and I really wanted to go on this adventure. So, I gave Luke a mischievous smile and said, "When will we start?" Luke&apos;s eyes lit up and he took out his sword which was bronze on one side and grey on the other. "How about, right now?" He then ran off and I followed him. He ran deeper and deeper into the forest until it got darker and I had no choice but to follow him. Then suddenly I heard a monstrous roar. Luke and I looked at each other. "Uh Luke... What&apos;s that?" I asked nervously. He smirked. "It&apos;s our first challenge." My eyes widened in shock when the monster appeared. It was a big and buff monster with a bull&apos;s head and the lower body of a human. It roared again and my eardrums almost exploded. It also smelled like it hadn&apos;t taken a bath for 3 weeks or even more. "Percy, ready to take out the Minotaur?" Luke asked out of nowhere. "Are you kidding me?!" I shouted at him. "C&apos;mon man! You&apos;re a god!" Luke&apos;s comment made me red. "I know you can take this out yourself with a single blow. So, I&apos;ll just stay here and watch your back." I gritted my teeth. "Fine! I&apos;ll do it!" I stepped forward. 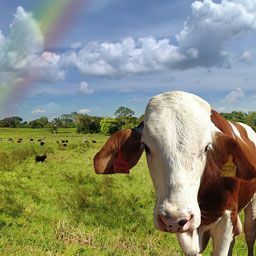 "Hey Papa Cow! Your breath stinks and you really need to toothbrush! Don&apos;t just stand there!" I shouted at the monster. I heard Luke chuckle behind my back. The Minotaur roared and charged at me. I had no time to uncap Riptide so I made myself a big fist of rock. Then, I punched the Minotaur straight in the jaw which made it move back a few steps. The force itself made the fist crack so I brought out my sword. After the Minotaur got out of its daze, it tried to grab me but I slashed at his hand, making him roar. But before I could do anything, he grabbed my sword with his other hand and threw it away. I cursed in my head and thought of something. I decided to do it Spanish style. I ran towards the tree Luke was leaning on and waved at the monster. "Hey Stinky Breath! Over here!" It roared and charged at me and Luke. Luke&apos;s eyes widened and his face grew pale, making me smirk. At the last second, the two of us jumped out of the way and the Minotaur got one of its horns stuck in the tree trunk. Suddenly, it got its head out, with one horn still stuck in the tree, and looked at us with madness in its eyes, making us back away. "Quick! Percy get the horn out! I&apos;ll distract it!" Luke shouted at me and immediately ran at the minotaur. I obeyed him and ran to the tree and got out the horn with all my might. I heard a thud so I turned to find out that the Minotaur had swatted Luke away. Then it turned back to me and roared angrily. I ran at it with full speed and embedded the horn in its stomach with all the strength I had left. Then the Minotaur groaned and fell backwards, dead. Suddenly, it crumbled into dust and only its broken horn was left on the ground. I felt something heavy materialize in my pocket and took it out. I smiled when I saw Riptide, my sword, in its pen form and I was amazed that it appeared again in my pocket. Then I remembered Luke so I wiped the sweat off from my forehead and looked for him. I heard a groan and I ran to the direction of the sound. Luke was on the ground with a deep gash on his forehead. "Look what you got yourself into. You said that it would be fun." I said to him, irritated. Then he surprisingly smiled. "Well, it was worth it." I helped him up and put my hand on his waist for support. He put his hand over my shoulder. When we walked over to the site, he smiled. "You should get that." He said. "You earned it, Percy." "Why would I get a stupid horn?" I asked him. "It&apos;s like a trophy you earn after winning a battle. Just get it." He urged me. I bent and got it. "Now, do you want me to chuck this down your throat?" I asked him with an annoyed frown. He just chuckled. "Just flash us out of here Percy." "What if I don&apos;t want to? Let&apos;s just walk. Besides, you made me do this and nothing is done for free." I smirked when I heard his groan. "Fine! Have it your way." Then we walked back to camp. It felt like hours since Luke was so slow. He directed me to the camp&apos;s infirmary and I laid him down on a bed letting the healers take care of him. Then suddenly, a teenage boy with the lower body of a goat came to me. "Lord Perseus! Lady Artemis is looking for you." I looked at him in shock and ran outside. A/N: Hi guys! I told you that I&apos;ll be back with another chapter so here it is! Yes, it was Luke and here is another cliffhanger cause I love you guys XD. Tell me if it was good by voting and commenting! I really tried my best so please give me some appreciation. Thank you guys and see you in the next chapter!